MVNA’s legacy of client support is a process that connects the community to its members in need. Non-medical health and safety items are donated to Community of Caring, funneled to MVNA and hospice staff who then give it to clients based on identified needs to support their plan of care. The acquisition of necessary items relies on the involvement of the larger community – YOU! Volunteers are vital to our program, from administrative support to building kits to maintaining our storehouse. Hold a drive to stock our shelves with our most needed items so we can help clients year-round! Items include diapers and baby wipes, bath towels, wash cloths, board books, cash donations, toys, gift cards, sheets sets, and more! We can purchase many items in bulk i.e. portable cribs, weight scales. Cash donations also allow us to address unique needs. When MVNA began in 1902, staff worked with Associated Charities to develop a “loan closet” of items needed by new mothers and babies. In 2000 that effort morphed into “Club 100” which became an award winning program that, by 2009, collected over $280,000 in donations used to help support over 1,400 families. 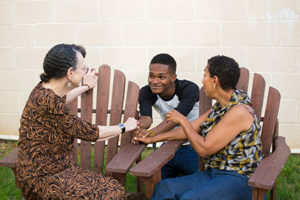 The impact of Club 100 was felt not only by the recipients of its donations, but by the donors and community who helped make this type of connection possible. Today, this “loan closet” is appropriately named “Community of Caring,” providing non-medical health and safety items to MVNA and hospice clients.